Laura Hutchison is a student in the Interdepartmental Ph.D. Program in Classical Art and Archaeology at Hopkins. Her research interests include Greek and Roman religion, the human form in ancient art, and modern issues in illicit trade of antiquities. She was excited and grateful to work so closely with ancient objects in preparation for The Roman House at Hopkins. This Lar bears a detailed garment, with well-defined drapery folds and two fibulae, or pins that hold the garment at the shoulders. 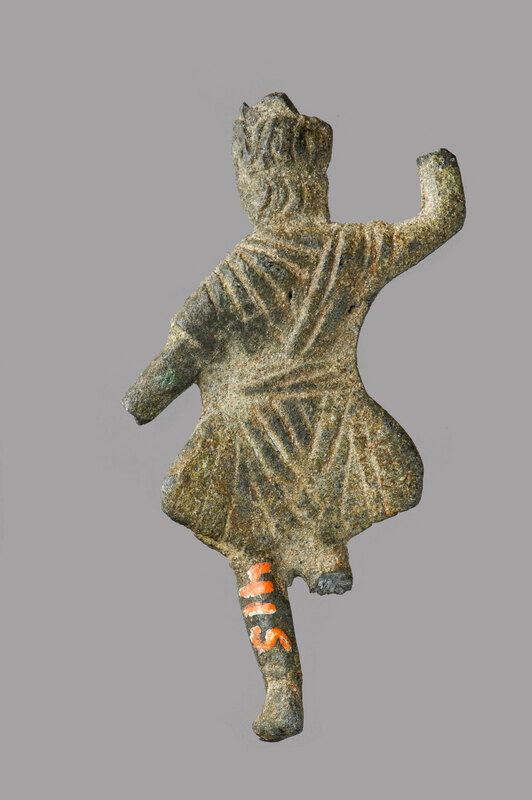 The figure stands in a dancing posture with the tunic flying back behind his hips as further suggestion of movement. The raised right hand of this figure likely held a rhyton, or horn-shaped vessel from which libations could be poured. The other hand likely held an incense box or a patera, now lost. Though the figure is stationary, the posture and attributes evoke the sensory experiences of worship, such as dance, taste, and smell. A famous literary example of a Lar can be found in the beginning of Plautus’ Aulularia, written in 195 BCE. The Lar of a Roman household introduces the play, and sets the plot into motion by manipulating members of the family. With Plautus’ character as the exception, the Lares were devoid of identifying personality traits or mythological traditions. Instead, households venerated the Lares as guardians of place. 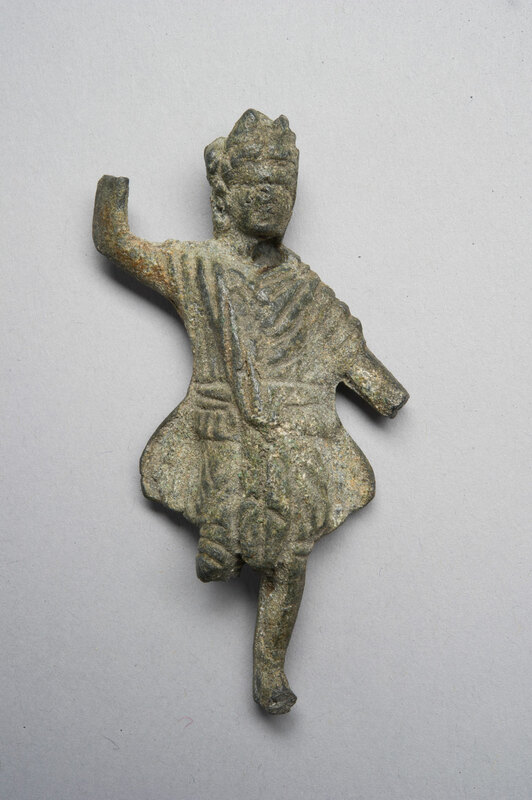 The statuettes of Lares displayed in the exhibition are dated much later than Plautus’ play, to roughly the 1st or 2nd century CE, but the continued representations of this deity attest to the ongoing importance of the Lar in Roman domestic religion.